Summer is nearly over, and after the recent heatwave here in Southern California, I’m more than ready to welcome fall weather. But before I put on my fluffy sweater and dive into pumpkin spice everything, I want to enjoy the tail end of peach season, don’t you? Farmer’s markets and stores near my home are still brimming over with fresh peaches, so I picked up some peaches and decided to give them a proper goodbye and send them off in style. 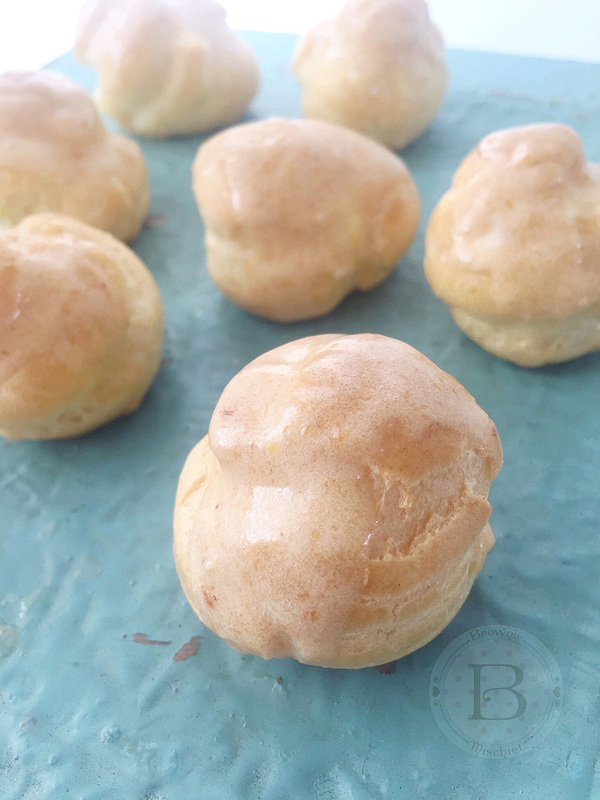 I created some luscious peaches and cream filled, bite-size puffs of choux pastry, called profiteroles. They’re like cream puffs, only smaller. The filling is creamy, but so light and airy that I’m convinced that these profiteroles have no calories! The recipe I’m sharing with you uses fresh peaches, but feel free to substitute frozen peaches if fresh peaches aren’t available. 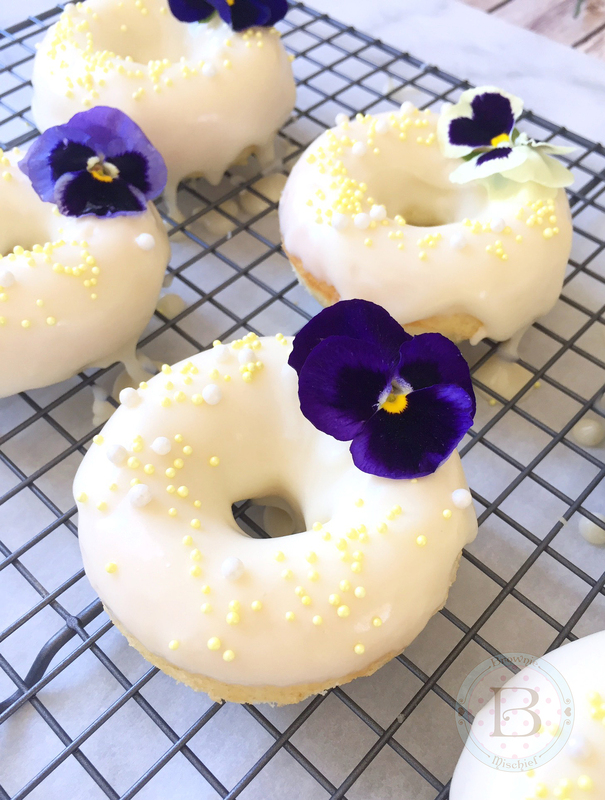 There are a lot of steps to this recipe, but the steps are done in stages and are very easy to do. 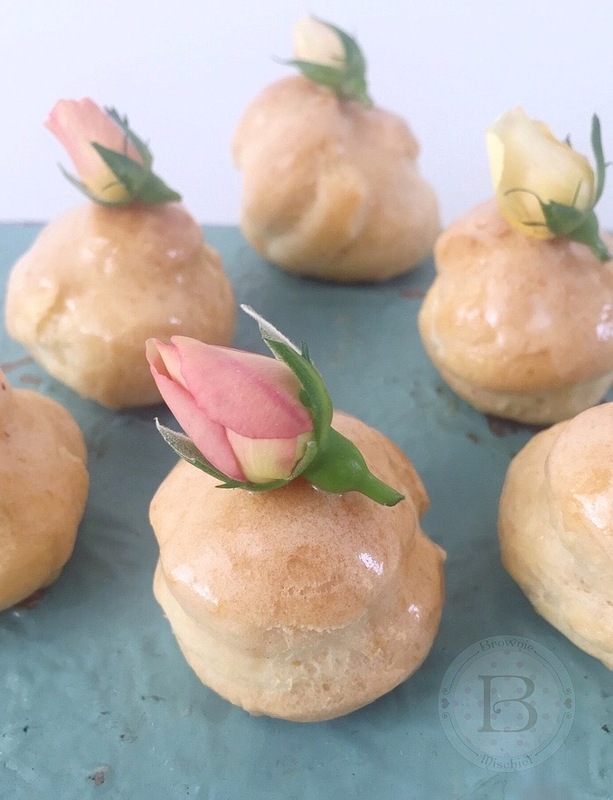 I decorated my profiteroles with fresh, pesticide-free miniature rosebuds, also known as spray roses. If you can’t find miniature rosebuds, pesticide-free rose petals would be a good substitute. 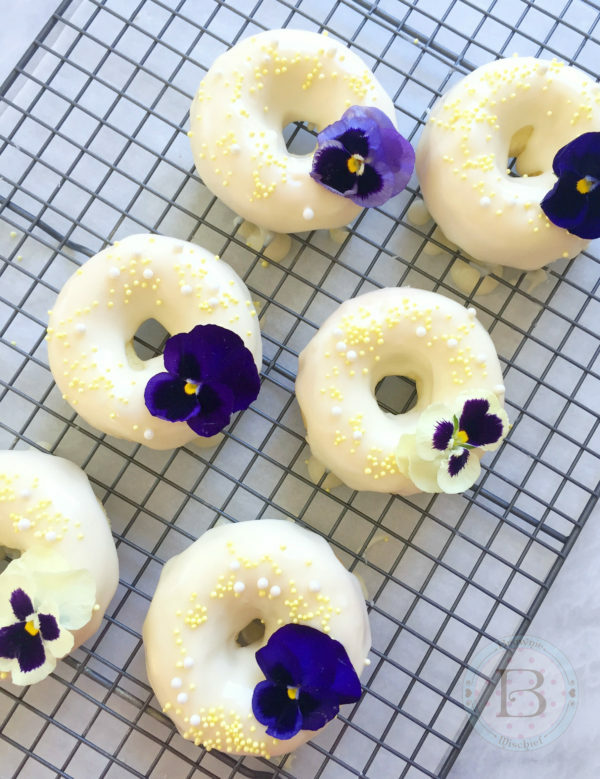 You may not get a chance to embellish these little beauties. 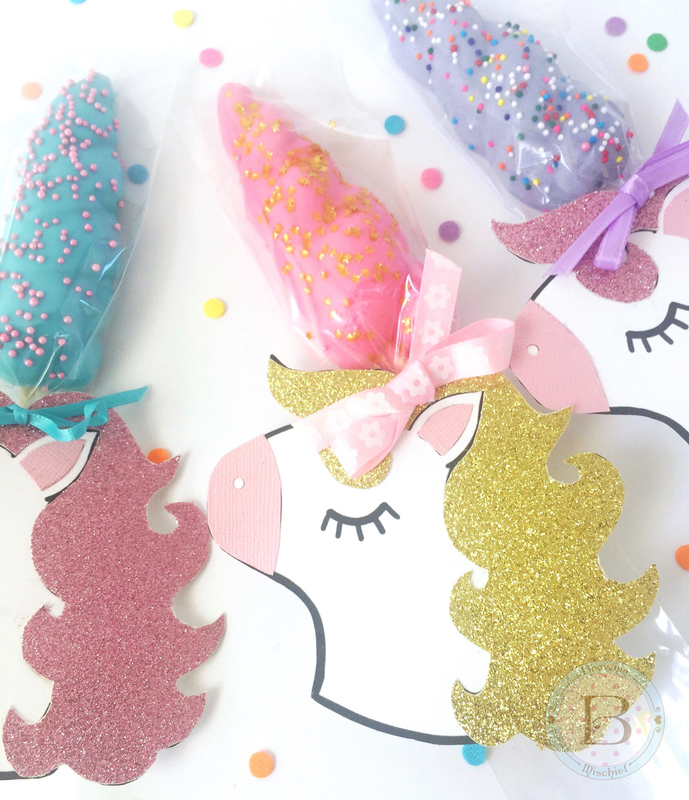 They have a way of popping into people’s mouths even before you can decorate them! 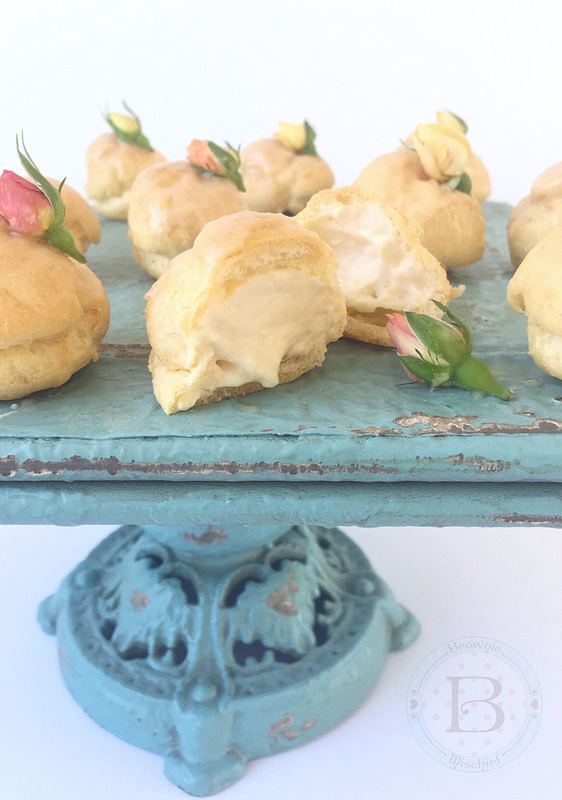 Bite-sized puffs of choux pastry filled with a creamy, fresh peach filling and topped with fresh peach icing. Purée peaches in a blender or food processor. Strain puréed peaches through a sieve. Stir in lemon juice. Place puréed peaches in a small saucepan. Bring to a boil over medium heat. Reduce heat and simmer until peach purée is reduced by half, about 5 minutes. Remove form heat. Add peach flavoring, if using, and set aside to cool completely. Bring milk to a boil in a small saucepan over medium heat. Meanwhile, whisk sugar, cornstarch and salt together in a small bowl. Add the egg and whisk until smooth. When milk starts to boil, remove from heat and pour 1/3 of the hot milk into the egg mixture and whisk to combine. Pour the egg mixture into the remaining hot milk and cook over medium heat, stirring continuously, until the mixture thickens and comes to a boil. Remove from heat. Stir in butter and extracts. Pour mixture through a sieve placed over a bowl. Cover pastry cream with plastic wrap. Let cool. Set aside 2 tablespoons of cooled peach purée. Add remaining peach purée to cooled pastry cream and stir to combine. Chill in refrigerator. In a medium bowl, whip heavy cream to stiff peaks with an electric mixer at high speed. Fold whipped cream into peach pastry cream mixture. Set aside in refrigerator. Preheat oven to 425º F. Line a large baking sheet with parchment paper. Combine water, butter and salt in a small saucepan and bring to a boil over medium heat. Reduce heat. Add flour and beat vigorously with a wooden spoon until mixture pulls away from the sides of the pan and forms a ball. Transfer mixture to a bowl and let cool for a few minutes. Add eggs one at a time and beat with an electric mixer at medium speed, until smooth. Pipe 1 inch balls, about 1 inch apart onto prepared baking sheet. Smooth tops with a wet finger. Bake 20-25 minutes until golden brown. Transfer to a wire rack to cool completely. Use a skewer to poke a hole in the bottom or on the side of each profiterole. Place tip into the starter holes and fill each profiterole with filling. In a small bowl, whisk all icing ingredients together and spoon over filled profiteroles. Decorate as desired. Serve immediately. *To make peaches easy to peel, blanch them in boiling water for about 45 seconds, then dunk in ice water. **To find Ateco tip 808, click here. ***To find Wilton tip 12, click here. Pi Day is a day to celebrate mathematics, or more specifically, the ratio of a circle’s circumference to it’s diameter. While I do appreciate math for it’s precision, I also feel a bit peeved at math for making my brain hurt! Ok, I’m sorry math. I forgive you. I do need you! How would I bake without you? 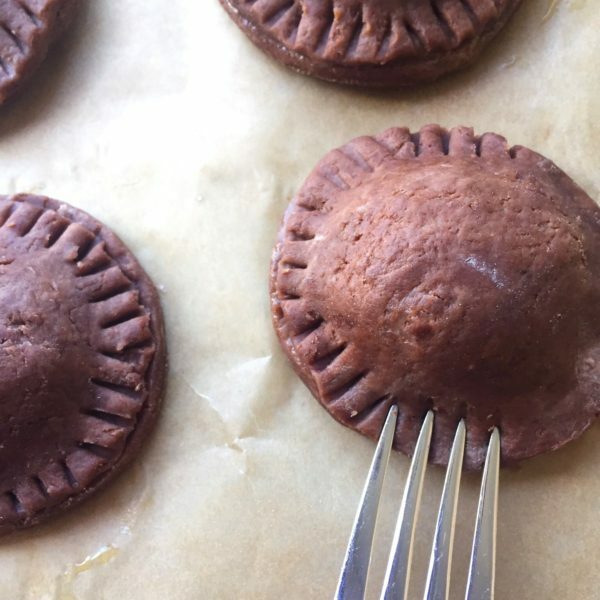 So today I will celebrate math (and also my love for puns) with these tender, fudgy mini hand pies! Since pi is all about circles, I used a 2 3/4-inch circle cutter to make round pies, but you can cut them into any shape you like. You could cut larger circles, fold them in half and call them empanadas. Rectangles are very popular with Pop Tart fans and you don’t need a special cutter, but a ruler would be helpful. I think squares would be cute, too! Whatever your shape of choice, my buddy math can hook you up! 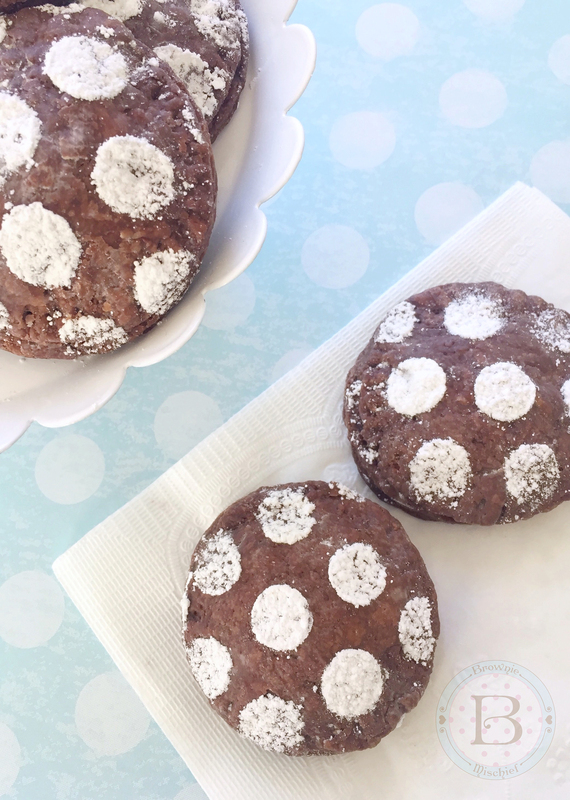 I used a stencil to add some powdered sugar polka dots to my mini pies. I may have gone a little overboard with my circles, but who’s going to stop me? 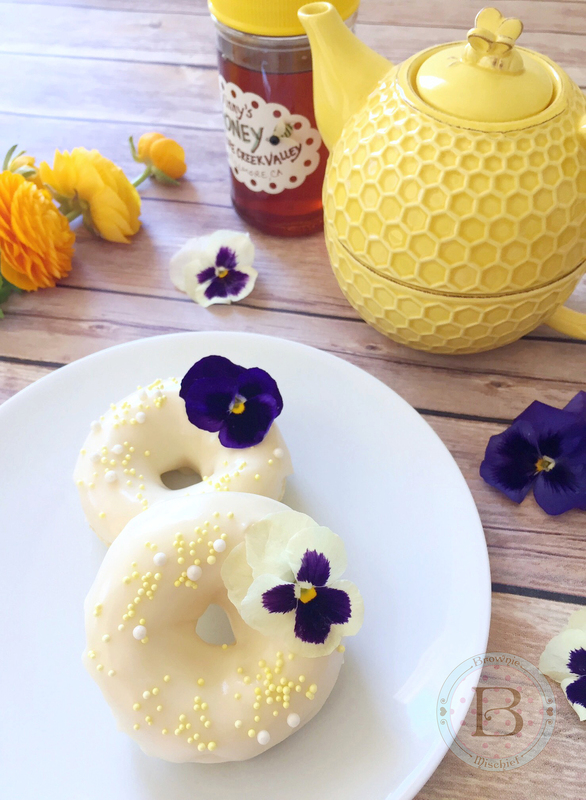 I think they look pretty cute, but If you don’t have a stencil, a sprinkle or two of powdered sugar will do just fine! Alternately, you could drizzle them with some melted white chocolate. I had a bit of white chocolate on hand, so I can confidently say, that version is yummy too! 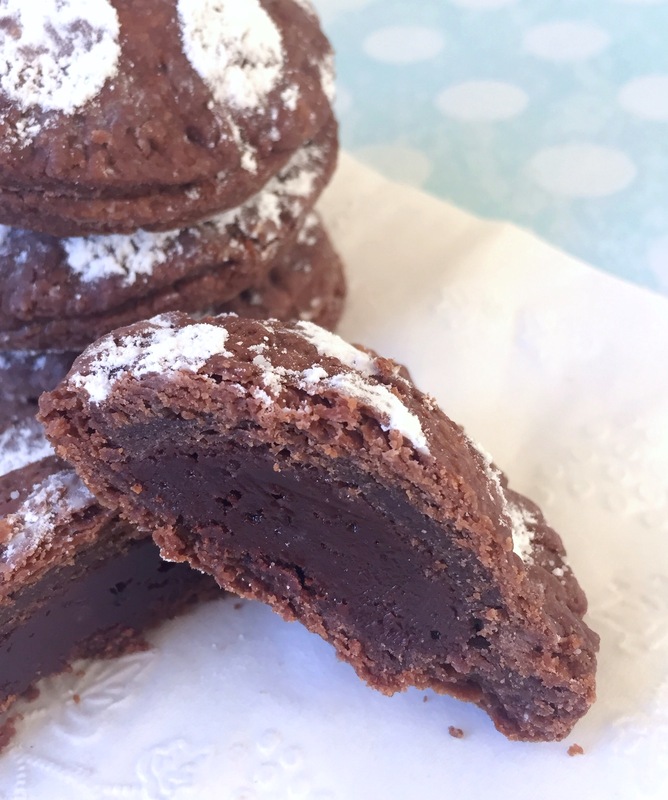 Mini chocolate pies with fudgy filling and a tender chocolate crust. 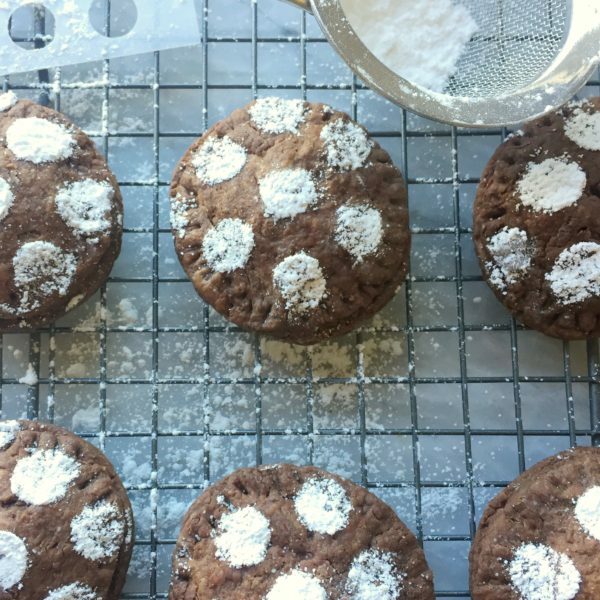 In a large bowl, sift together flour, cocoa powder, sugar, salt and baking powder. Add butter and cream cheese to the flour mixture. Use a pastry cutter or your fingers to cut butter and cream cheese into the flour mixture until it resembles pea-sized crumbs. Add 2 tablespoons of the cold water to the mixture. Stir gently just until the mixture begins to hold together. Turn mixture out onto work surface. Press mixture together and fold over onto itself. Form dough into a disk. Wrap in plastic wrap and refrigerate for 1 hour. In a small microwavable bowl, melt chocolate chips and sweetened condensed milk in the microwave. Heat for 10 second intervals, stirring until smooth. Preheat oven to 375ºF. Line a large baking sheet with parchment paper. In a small bowl, whisk together egg and remaining 1 tablespoon water. 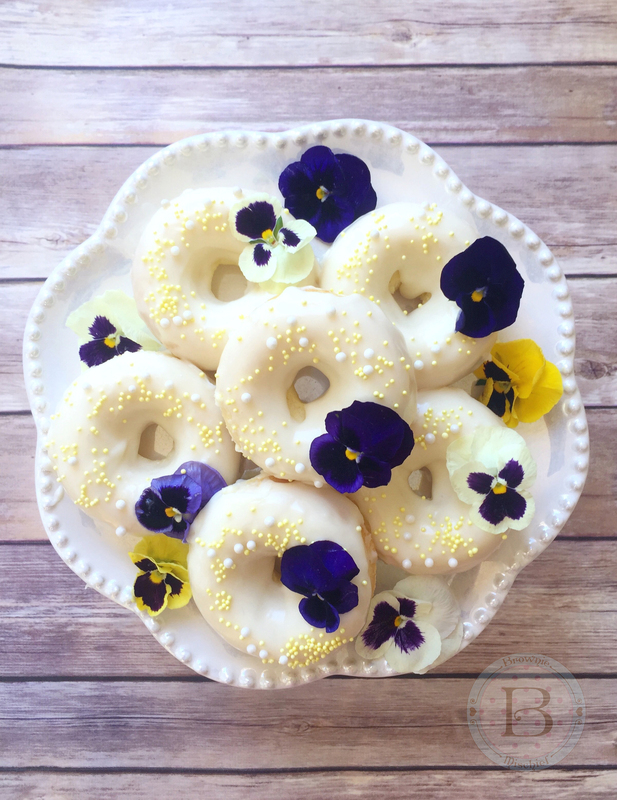 On lightly floured surface, roll dough to 1/8-inch thickness. Cut out 20 circles with a 2 3/4-inch circle cutter (or cut into desired shapes of your choice). Place 10 dough circles about 1 inch apart onto prepared baking sheet. Top each with 1 tablespoon of filling. 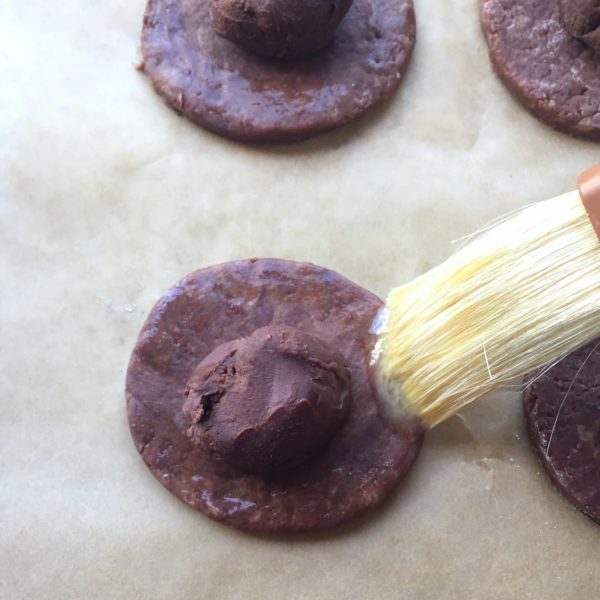 With a small pastry brush or your finger, brush egg mixture around the perimeter of each of the filled dough circles. Top each with the 10 remaining dough circles. Crimp edges together with a fork. Brush pies with remaining egg mixture. Bake for 25 minutes or until crust is crispy and browned. Transfer to wire racks to cool. Sprinkle cooled pies with powdered sugar or drizzle with melted white chocolate. *The chocolate chips you use depends on personal preference. Bittersweet chocolate chips give a more intense chocolate flavor, while semi-sweet chocolate chips yield a slightly sweeter finished product. To find my favorite circle cutters click here. To find the polka-dot stencil click here. My relationship with Valentine’s Day has transformed over the years. When I was a child, I joyfully skipped home from school with my bounty of tiny Valentine cards, candy hearts and a cupcake someone’s mother baked. As I grew older, I was hot and cold towards Valentine’s Day, depending on the state of my love life at the time. After having kids, Valentine’s Day became about red construction paper, doily hearts and glue sticks. I happily cleaned up sprinkles and kissed chubby, frosting-stained cheeks. Now I think of Valentine’s Day as simply a day to celebrate love. I embrace Valentine’s Day and all the hearts, roses and chocolates that go with it! Show your loved ones that you love them on Valentine’s Day, but more importantly, show them throughout the year, by loving, respecting and accepting them for who they are every day. 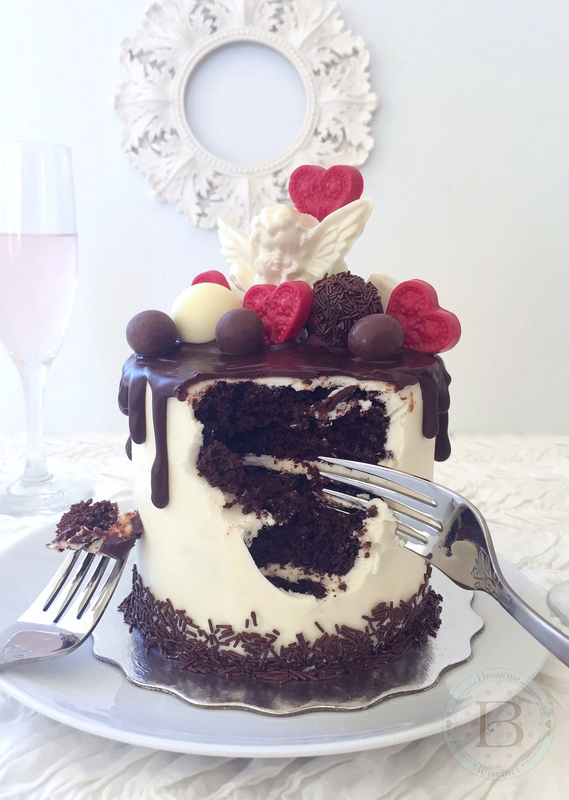 If your heart beats for a chocolate lover, then this Valentine cake for two will have them swooning. 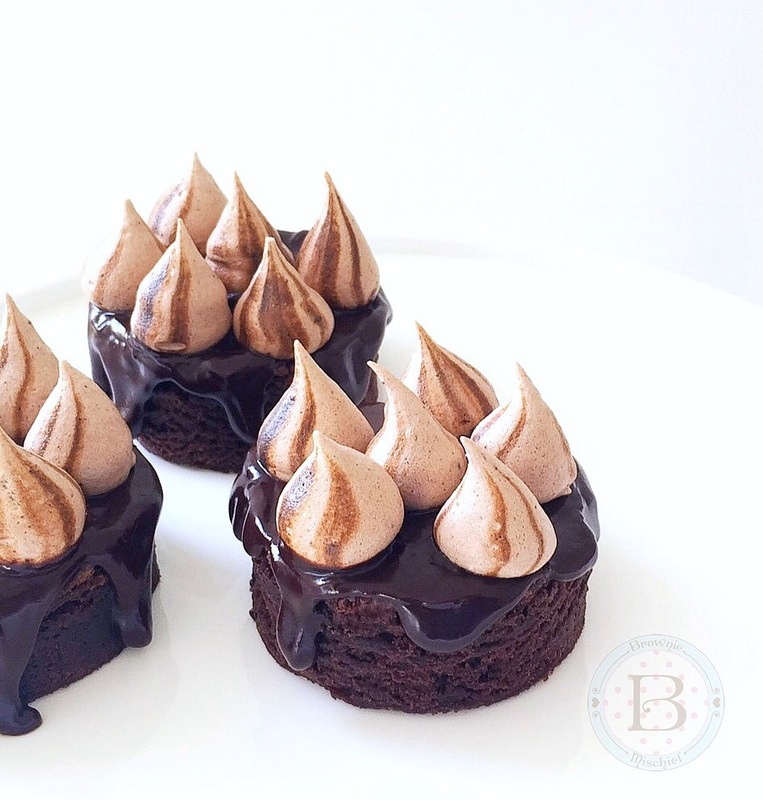 It’s small in size, but grand in chocolate indulgence. It has three layers of moist chocolate cake, rich, white chocolate buttercream and a silky chocolate glaze. As if that isn’t enough, I loaded the top with chocolate candy! Some of the candy is store bought and some I made with candy melts and chocolate molds. Click here to find the cherub mold. Click here to find the heart mold. 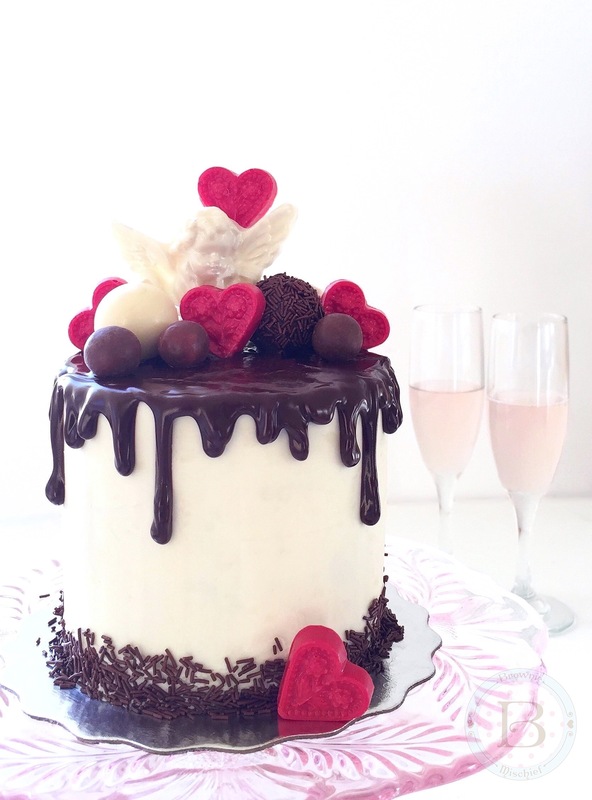 I hope you share this Valentine cake with someone you love! However you celebrate the day and whoever you love, have a happy one! A mini chocolate cake with white chocolate buttercream, topped with chocolate glaze and chocolate Valentine candy. Perfect for sharing! Preheat oven to 350°F. Grease & flour three 4-inch cake pans. *See note below. Sift flour, cocoa powder, baking powder, baking soda and salt together in a medium bowl. Add sugar and stir to combine. Combine egg, buttermilk, vegetable oil and vanilla extract in a small bowl. Whisk lightly to combine. Add egg mixture to dry ingredients and mix on low speed with a handheld electric mixer, until combined. Stop mixer. Scrape sides of bowl with spatula. Turn mixer up to medium speed and beat for 1 minute. Add hot coffee and stir until incorporated. Pour batter into prepared cake pans, dividing batter evenly between the pans. Bake for 20-25 minutes or until a toothpick inserted into the center of the cake comes out clean. Cool cakes in pans 10 minutes, then invert onto a wire rack to cool. Set white chocolate aside to cool until lukewarm and still soft. In a medium bowl, beat butter with an electric mixer at medium speed until pale and creamy. Add vanilla extract, salt and melted white chocolate. Beat at low speed until combined. Stop mixer. Scrape sides of bowl with spatula. Add powdered sugar. Beat at low speed, until powdered sugar is combined. Beat at medium speed until buttercream is smooth, stopping to scrape the bowl occasionally. Keep covered at room temperature until ready to use. When cakes have cooled completely, trim the cake layers to 1-inch tall. Attach one of the layers to a cake board with some of the white chocolate buttercream. Apply 1/4-inch thick layer of buttercream to the top of the cake layer, followed by the second cake layer, another 1/4-inch thick layer of buttercream, then the final cake layer. 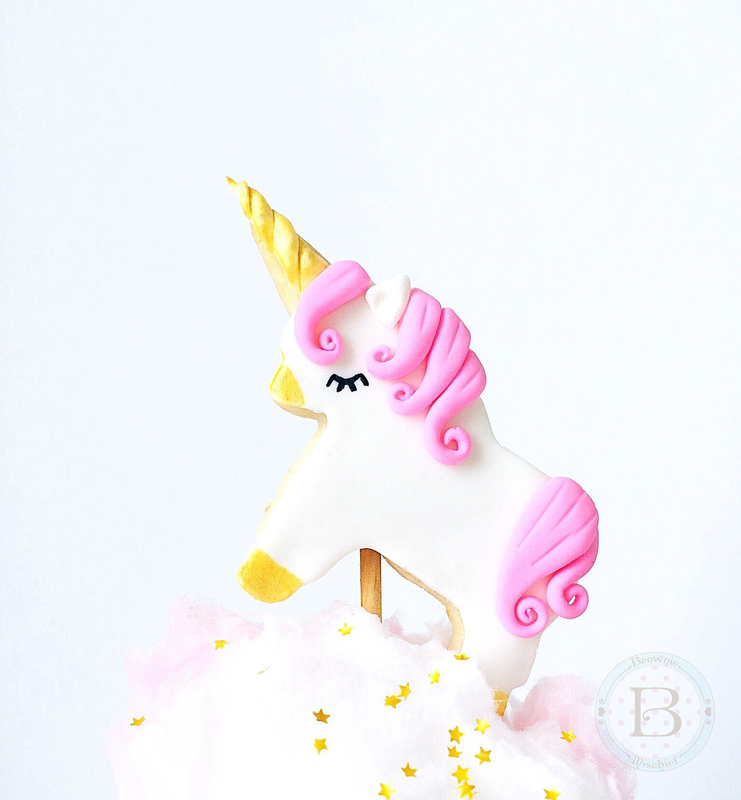 Apply a crumb coat (thin layer) of buttercream to the cake. Chill the cake in the refrigerator for 20 minutes. Frost the cake with the remaining buttercream. Apply chocolate sprinkles to the bottom edge of the cake. Melt chocolate drip glaze ingredients together in a double boiler over gently simmering water. Let cool slightly. Spoon chocolate glaze into a piping bag. Snip off the end of the bag with kitchen scissors. Drizzle chocolate glaze along the edges of the perimeter of the cake, then fill in the middle. Smooth top with a small offset spatula. Top cake with assorted chocolate candy. If desired, you can stack some of the candy and adhere them with melted chocolate to give some variation in height. *Click here to find 4-inch cake pans.